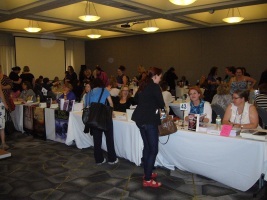 By all accounts the 4th Australian Romance Readers Convention—ARRC2015—was a roaring success! We like to think it just might have been the best one yet! Those last few weeks flew by so quickly, and the convention itself felt like it was over in a blink! The program for the convention was absolutely jam-packed, so we definitely kept everyone on their toes! 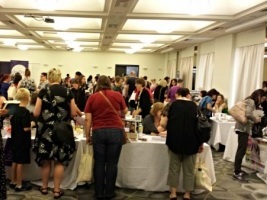 It was certainly big: in the end we had 236 delegates, plus another 43 readers who came just for the signing. 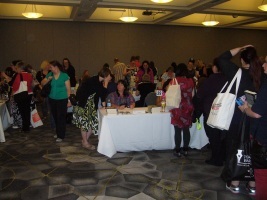 That totals 279 attendees, which is the exact number of attendees we had at the first convention in Melbourne. 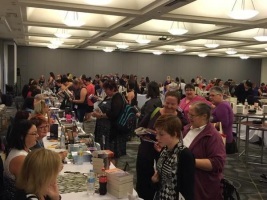 We had four truly awesome keynote speakers, 23 breakout sessions, including some that were activity based, mystery author tables, keynote lunches, book launches, the epic book-signing event (with a record 89 authors) and a Regency fashion parade. It was an ambitious program of events and we are thrilled with how smoothly it went. But that wasn’t all. We also had our traditional welcome reception, followed by the new addition of a trivia night, the awards dinner, and also a new sight-seeing tour ahead of the convention and a wind-down lunch cruise the day following the convention. Delegates were completely spoilt for choice, and many of them chose everything. Attendees left on a high and utterly exhausted. Job well done! There are more details below. Our heart-felt thanks to every single person who contributed to make the event so successful. Thanks also to all our sponsors, particularly our platinum sponsors—Booktopia and eXtasy Books. Our keynote speakers at ARRC2015—Helene Young, Kelley Armstrong, Victoria Dahl and Sylvia Day—were awesome! Helene Young gave the opening address and spoke about life, success and ‘all things amazing about girl power’. Interspersed with photos of the yacht she lives on and gorgeous sunsets and sunrises, Helene took us through a journey of the women who have inspired her—both real-life women and fiction heroines—such as Purdy and Princess Leia. Delegates called her speech entertaining, informative and inspiring. Kelley Armstrong spoke about how romance has influenced her writing. From her description of the very familiar search for the type of book that resonated with her, to including that same strong romance theme in her books, to her realisation that she didn’t want to write stories that had no romance in them. Delegates also found her speech very entertaining. Unfortunately Victoria Dahl lost her voice not long after she arrived in Canberra, but after a few days of taking it easy she was ready for her keynote, if still slightly husky. Victoria spoke about being an unsympathetic heroine, and finding her writing voice when she started writing heroines who were not perfect. She talked about how she wants romance writers to write about all types of heroines, because everyone deserves a happy ending. Victoria’s talk was rated most highly of all sessions. The audience found it truly inspiring, especially as it was International Women’s Day. Sylvia Day gave the closing speech. She talked about her early life and where her love of reading came from. From her first book hangover at the age of 12 she knew that she wanted to write romance. Many years later, after a military career and having children, she rediscovered her love of reading, and then started writing. The story of her journey was fascinating. If you missed any of these keynote speeches, you can catch up with them on the ARRC2015 CD, which will go on sale soon (watch the blog for details). 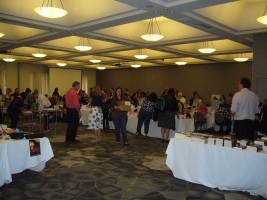 The signing at ARRC2015 was on track to be our biggest one yet! With 92 authors expected we had to get really creative with the floor plan to fit them all in, which meant we had tables spread out over a ballroom and a half. In the end we had 89 authors signing, with three authors dropping out due to illness, but that still makes this the largest signing—by one! The turnaround time for the signing setup was very tight, but luckily we had a band of very industrious helpers and they quickly transformed the ballroom into a sea of tables with books set out ready for the authors. We took a few photos just as the signing was starting. There seemed like there was plenty of room for readers … But then it got busier … and busier, and the room became noisier and very crowded! 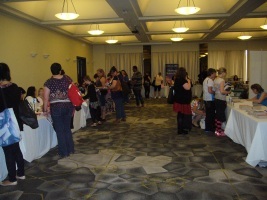 The readers had an awesome time at the signing, and left with bulging bags of books. Check back for Part 2 of the wrap-up tomorrow, where we have details of social events, including some of the new events introduced at ARRC2015. I agree, it was a great event. Congratulations to the organisers on their hard work and thank you to the authors and readers who made it awesome.